Start your holiday off right with your collectable gift bag filled with coupons and swag from local merchants! 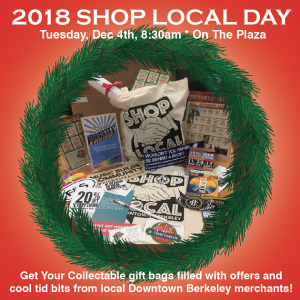 Pick up yours at the Downtown Berkeley BART Plaza on December 4th at 8:30AM. We’ll be out there while supplies last! We have so many awesome shops downtown. Perfect inspiration when picking out gifts for loved ones.